of NH, formerly of Woburn, April 8th. Beloved wife of the late Joseph Leo Curtin. Devoted mother of Carolyn Carrasquillo of NH, Pamela McIntyre, her husband Daniel of No. Reading and Laurieanne Morgan, her husband John of Salem, NH. Cherished grandmother of Alissa, Joey, Raquel, Amber, Selena, Austin, Megan, Ava and Ryan. Dear sister of Frances Queen of Woburn and great grandson Cole. At the families request, all services are private and under the direction of the Lynch- Cantillon Funeral Home 263 Main Street, Woburn, MA. In lieu of flowers, remebrances may be made in her memory to the Sturge-Weber Foundation, 12345 Jones Road, Suite 125, Houston, Texas 77070. 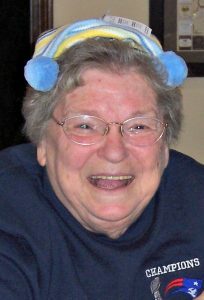 Margaret E. (Zeringis) Curtin– of NH, formerly of Woburn, died peacefully with her daughters by her side, Monday, April 8th at the Holy Family Hospital in Methuen. She was the beloved wife of the late Joseph Leo Curtin. Born in Tewksbury, Margaret was the loving daughter of the late Patricia (Zeringis) Reagan. She was a graduate of Woburn High School. She then went on to attend the Burdett College in Boston. She worked several years at Raytheon, where she met her husband Joe. Margaret’s early years were spent raising her children. As they grew older she took a job working as a bookkeeper, at various places including O’Neil Insurance and K Mart as she loved working with numbers. She enjoyed annual summer trips to Lake Winnipesaukee with her family and loved going to the dog track with her husband. But it was her grandchildren that brought her the greatest joy. You could always count on seeing her on the sidelines of a soccer field, the bleachers of a basketball game or at a gymnastics meet. She rarely missed a game especially when the grandchildren were young. She would sometimes get a little too rowdy! She was an avid sports fan and always enjoyed watching the Red Sox too. The greatest lesson Margaret passed along to her kids is the importance of friendships in life. Having grown up an only child she quickly established many friends she carried throughout her life. Friday night cards games with friends were one of the highlights in their house in Woburn. Additionally, she loved to play BINGO, always with friends as well. Devoted mother of Carolyn Carrasquillo of NH, Pamela McIntyre, her husband Dan of No. Reading and Laurieanne Morgan, her husband John of Salem, NH. Cherished grandmother of Alissa, Joey, Raquel, Amber, Selena, Austin, Megan, Ava and Ryan. Dear lifelong friend of Frances Queen of Woburn. At the family’s request, all services are private and under the direction of the Lynch- Cantillon Funeral Home 263 Main Street, Woburn, MA. In lieu of flowers, remebrances may be made in her memory to the Sturge-Weber Foundation, 12345 Jones Road, Suite 125, Houston, Texas 77070. At the families request, all services are private and under the direction of the Lynch- Cantillon Funeral Home 263 Main Street, Woburn, MA. In lieu of flowers, remebrances may be made in her memory to the The Sturge-Weber Foundation, 12345 Jones Road, Suite 125, Houston, Texas 77070. Our deepest condolences to the family. Peg was such a nice lady; always very kind to us. May you all find strength from each other during these difficult times and may Peg be at peace.